This best-selling textbook presents a comprehensive and accessible overview of the study of memory. 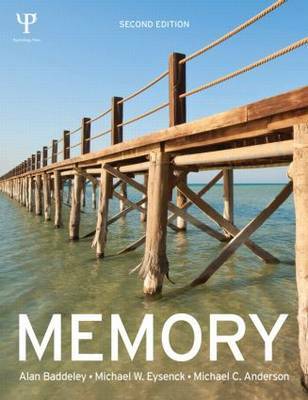 Written by three of the world's leading researchers in the field, it contains everything the student needs to know about the scientific approach to memory and its applications. Each chapter of the book is written by one of the three authors, an approach which takes full advantage of their individual expertise and style, creating a more personal and accessible text. This enhances students' enjoyment of the book, allowing them to share the authors' own fascination with human memory. The book also draws on a wealth of real-world examples throughout, showing students exactly how they can relate science to their everyday experiences of memory. Alan Baddeley is Professor of Psychology at York University and one of the world's leading authorities on Human Memory. He is celebrated for devising the ground-breaking and highly influential working memory model with Graham Hitch in the early 1970s, a model which still proves valuable today in recognising the functions of short-term memory. He was awarded a CBE for his contributions to the study of memory, is a Fellow of the Royal Society, of the British Academy and of the Academy of Medical Sciences. In 2012 he was the recipient of the BPS Research Board's Lifetime Achievement Award recognising his outstanding record of personal achievements and significant contributions to the advancement of psychological knowledge. Michael W. Eysenck is a Professorial Fellow at Roehampton University. He is also Emeritus Professor and Honorary Fellow at Royal Holloway University of London. Within his research he has focused on various topics within memory research (e.g., levels of processing; distinctiveness). However, for many years his research has focused mainly on anxiety and cognition (including memory). He is the best-selling author of a number of textbooks including Cognitive Psychology: A Student's Handbook, 6th Edition (with Mark T. Keane) (2010), Fundamentals of Cognition, 2nd edition (2012), Simply Psychology, 2nd edition (2013) and Fundamentals of Psychology (2009). Michael C. Anderson was the director of the Memory Control Laboratory at the University of Oregon until 2007. He then moved to the University of St. Andrews, Scotland, where he accepted a Chair in Cognitive Neuroscience, before finally moving to the MRC Cognition and Brain Sciences Unit in Cambridge, England in 2009. Professor Anderson's research on memory control has been featured in Newsweek, US News and World Report, the New York Times, CNN, BBC World News, and the New Scientist.